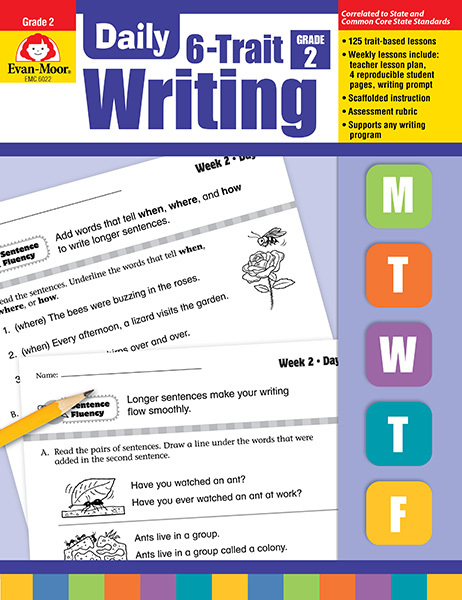 Develop your grade 2 studentsâ€™ writing skills in each of the six traitsâ€”Ideas, Organization, Word Choice, Sentence Fluency, Voice, and Conventionsâ€”using 125 engaging, 10- to 15-minute writing lessons. â€¢ 125 trait-based lessons â€¢ 25 weeks of instruction â€¢ Each weekly unit includes: â€“teacher lesson plan â€“4 reproducible student pages â€“writing prompt â€¢ Supports any writing program â€¢ Models many forms of writing â€¢ Teacher rubric Provide your students with frequent, focused skills practice with this Reproducible Teacher's Edition. The reproducible format and additional teacher resources give you everything you need to help students master and retain basic skills. 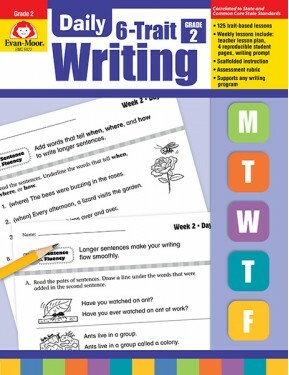 Grade 2, Reproducible Teacher's Edition, Develop your students' writing skills in each of the six traitsâ€”Ideas, Organization, Word Choice, Sentence Fluency, Voice, and Conventionsâ€”using creative and dynamic writing lessons! 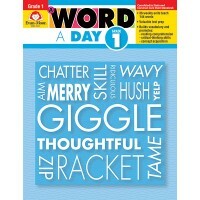 Support any writing program with 125 engaging, 10- to 15-minute lessons.